Very simple and delicious roast meal to start with…. I had a salty roast chicken! Oh. This chicken dish isn’t very salty, in fact. It has just a tinge of saltish flavor on the aromatic and juicy chicken meat. You’ll like it. (1) Remove chicken head, feet and internal giblets. Do not cut open the chicken. Rinse and pat the outer skin dry. (2) Rub salt in the entire body cavity, followed by drizzling chicken powder and white pepper in it. (3) Now, drizzle and rub salt on the outside (on the entire chicken skin surface). Season for an hour in the refrigerator. (4) Preheat oven at 180deg Celsius for 15 minutes. Place marinated whole chicken on a lined (with aluminum foil) tray and return the tray to the middle rack of the oven. Roast chicken for 25 – 35 minutes, or until whole chicken turns golden brown. (5) Remove chicken from oven and place it on a large dish. There will be chicken oil remained in the tray, do not discard the oil. Drizzle chicken oil on the chicken to make it more flavorful and saucy, when serve. It’s simple to prepare, with a taste you’ll like. 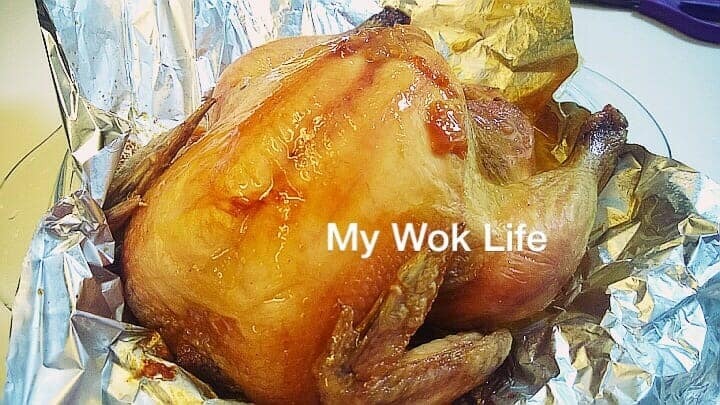 A small portion of salted roast chicken with skin counts about 240kcal. Tips: Increase the heat to 200 deg Celsius, if chicken is large. * Beware of the hot chicken oil/ juice when chopping the roast chicken to serve. Retain the flavorsome chicken oil and drizzle on the chopped chicken when serve. * This roast chicken may not yield dark brown skin unless light soy sauce is used to rub on its skin instead of using salt. You have the choice. * Use of natural sea salt is not as salty as table salt, but can do. Great and simple recipe. I cooked the chicken with happycall. Worked out perfectly. Got thumbs up from the children and hubby. Thanks. Next round, I am going to add a little wine to try out.